Mexico is an imploding hellhole. And in the spirit of redistributionist Democrat Party liberalism, America should be an imploding hellhole, too. If you don’t think America should implode just like Mexico, you’re a racist. And under his leadership, great progress has been made. Mexicans sweat in the heat and walk in the dust as they slowly starve. And you vile American scum should damn well sweat like a pig in the dust without food, too. You can help make it happen. You can assist in the takeover of America by illegal immigrants who bring their culture of corruption along with them as they openly usurp our once-sacred vote. And all you have to do to “fundamentally transform” America in Mexico’s image is vote Democrat. SEATTLE – When Maria Gianni is knocking on voters’ doors, she’s not bashful about telling people she is in the country illegally. She knows it’s a risk to advertise to strangers that she’s here illegally — but one worth taking in what she sees as a crucial election. The 42-year-old is one of dozens of volunteers — many of them illegal immigrants — canvassing neighborhoods in the Seattle area trying to get naturalized citizens to cast a ballot for candidates like Democratic Sen. Patty Murray, who is in a neck-to-neck race with Republican Dino Rossi. Pramila Jayapal, head of OneAmerica Votes, says the campaign is about empowering immigrants who may not feel like they can contribute to a campaign because they can’t vote. In close elections across the country, the immigrant and minority vote is considered key for candidates, especially Democrats. One picture from a pro-illegal immigrant demonstration says it all. This is the way it ought to be! 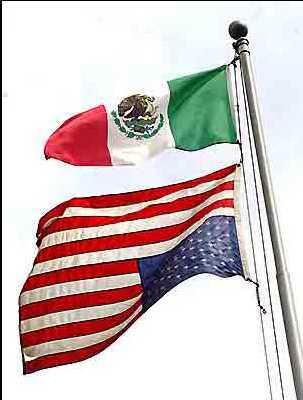 This could happen in your town: the Mexican flag flying majestically above; the American flag upside-down in distress beneath it. Isn’t it beautiful??? Hope IS making a comeback! PLEASE help the Democrat Party further undermine “the Great Satan” on November 2.